YCAN members have a message we want to send to the City of Yarra, and on Sunday we did that with what some people think is a load of rubbish. During the week, we collected our food scraps. 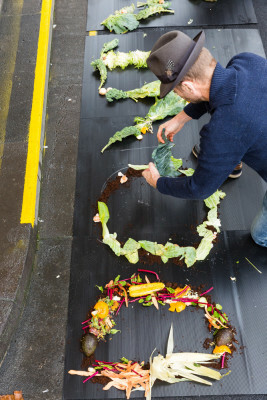 Then, outside Richmond Town Hall, we wrote our message in cabbage leaves, pumpkin skin and orange peel. And this is the result. We were pretty proud of our work. Sending food waste to landfill costs ratepayers a lot of money. Not only that, when it goes to landfill it quickly gets covered and decomposes anaerobically (without oxygen). This process emits methane, a greenhouse gas with 28 times the global warming potential of carbon dioxide. There are alternatives. Food scraps can be converted into compost, fertiliser or biogas. 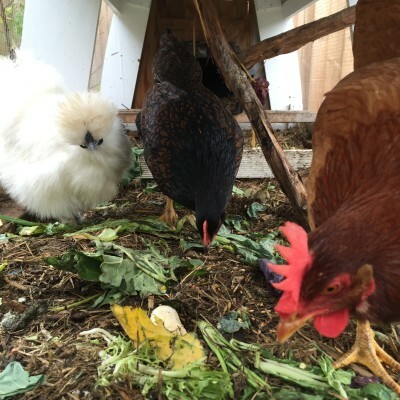 We gave these food scraps to some very appreciative chooks. But not everyone in Yarra has access to chickens, or the space to compost. 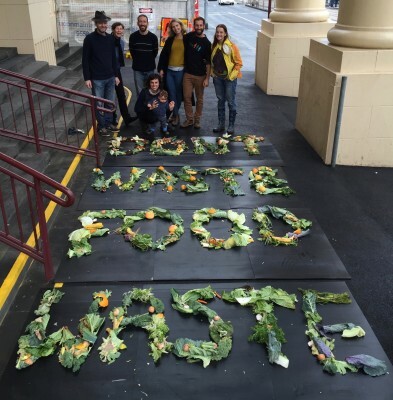 What we want is a system that gives all Yarra residents an alternative to putting their food scraps in the bin. 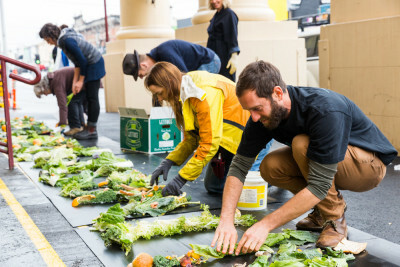 We reckon that if councils and shires around the country, such as Wodonga, Port Adelaide, Colac Otway and Mitcham SA, can recycle their food waste, then so can Yarra. Food scraps are not a load of rubbish.